Patch of Woods - Wellesley Conservation Council, Inc.
A Patch of Woods on Glen Road was given in memory of Sabra and Russell Sanders by their families in 1964. It was Mrs. Sanders' wish that this mixed woodland across the brook from their former home be preserved in its natural state. There is a short path through oak and birch trees and down an incline to Cold Stream Brook which flows from the Carisbrooke Reservation to Wight Pond. This sanctuary provides a small natural area buffer in a residential neighborhood. 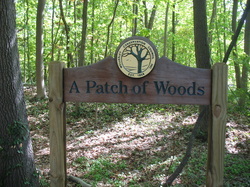 For directions to Patch of Woods click here. For a map of Patch of Woods click here.